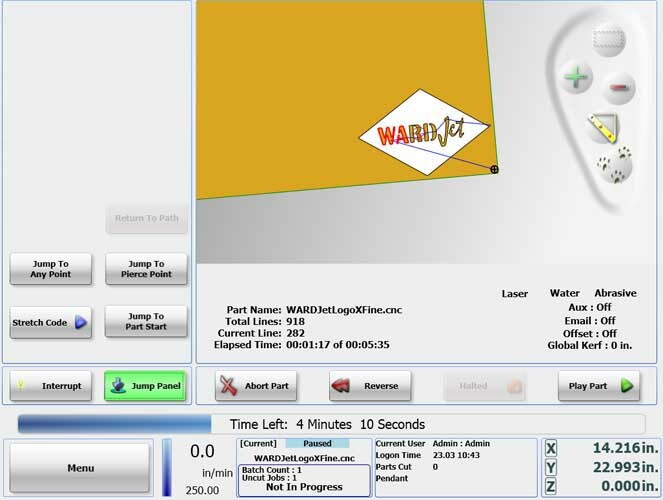 Ikuhlu is WARDJet's fast, user friendly, easy to learn waterjet controller software. Its advanced capabilities allow you to reliably waterjet cut quality parts efficiently. Track an unlimited number of consumable items in real time. 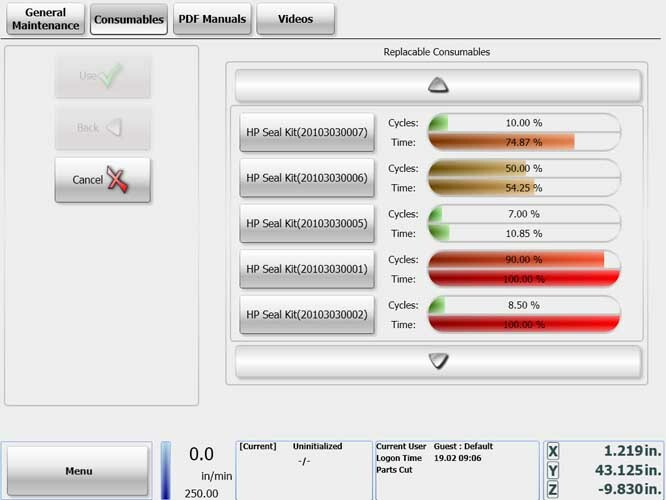 Accurate information on consumables helps with preventitive maintenance and saves time. To cut large parts (e.g. 20’x10’ on a 6’x13’ table). Cut the first portion of part program, move material, easily pick up the position of next program and cut! 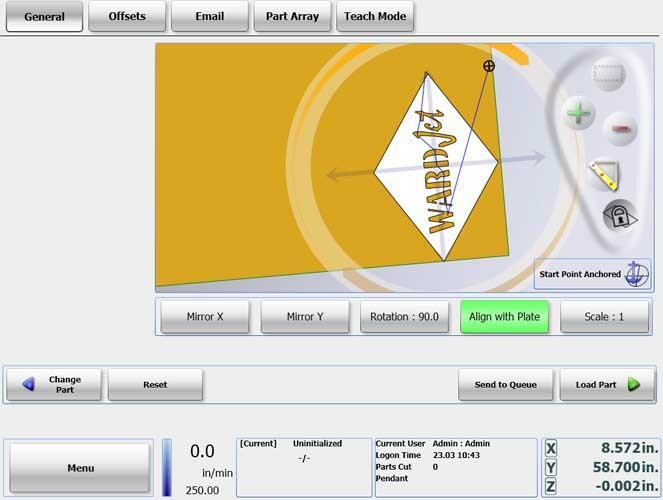 Using the built-in “Teach” mode, the machine can be used as a digitizer the size of the waterjet table. 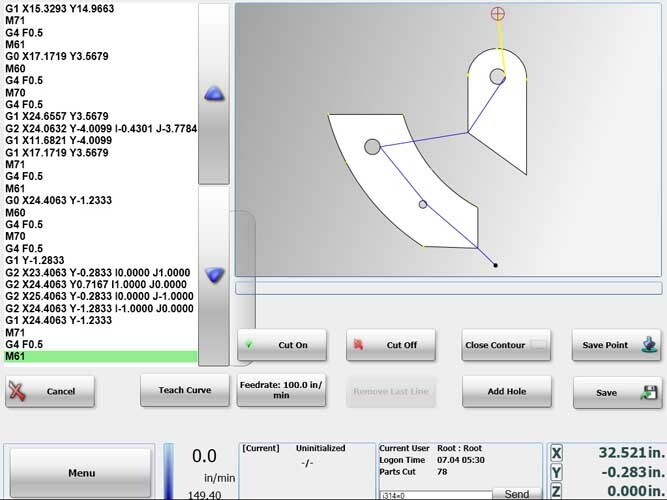 Just use the controller’s jog controls to “trace” your template, point by point, to create CNC files right at the controller! Drawing curves and lines are fast and simple - no need to use CAD/CAM software. Updates are available as new features are added. By checking the update site and installing the latest version, you can stay on the cutting edge of controller technology. While a part cuts, the total time remaining is displayed, along with a progress bar that fills up as you cut. 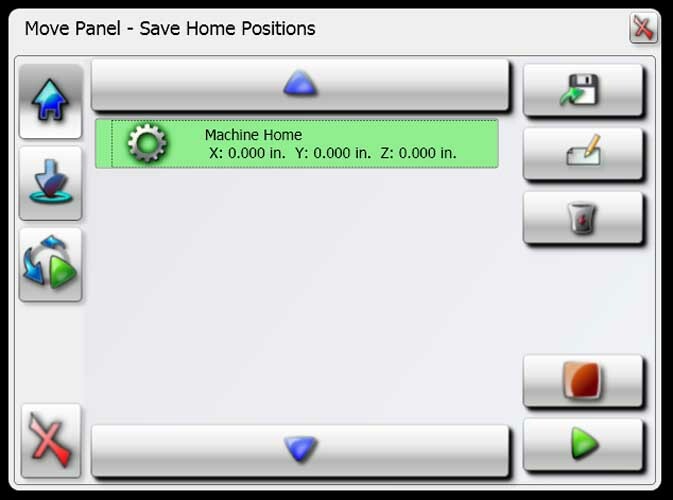 The controller can be configured to send out e-mail notification after the completion of a part. E-mails include an image of the part that was cut, along with who cut it and the amount of time it took to cut. Squareness of a gantry system is critical to cutting accurate parts. The controller continuously monitors motor travel and notifies the operator when it's time to re-home. Tech support and diagnostic troubleshooting can be done anywhere in the world. A skilled technician can control your waterjet remotely through the internet. The controller accepts standard G-Code parts, so you're not locked into any specific software package to create parts for your machine.